I have mentioned my session at the Stockholm SharePoint Saturday several times in this blog and even bragged about the good reviews I got from the people who listened to me. Now you can judge for yourself, as my session was recorded. The premiere SharePoint Saturday event was held in 2009, and today SharePoint Saturdays are held all over the world. This year was the first time in Stockholm, and I was invited to speak. I am currently working on a project where I am planning the move of millions of files into SharePoint. This is probably a task that many IT professionals will be asked to perform in the future, so I decided to talk about it in my session at SharePoint Saturday Stockholm. The subject for my speech was "Fileshare to SharePoint – things to consider", but I did not only talk about what you should think about. I also gave tools for file inventory and for the actual migration, as I shared several PowerShell scripts to use as templates. Here is my recorded session now, and below it you can find links to more information. 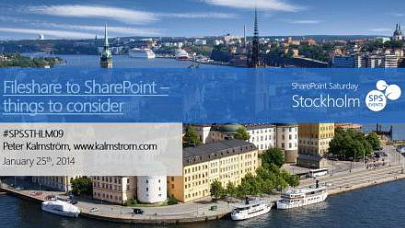 In the kalmstrom.com Tips section there are four articles about my session at SharePoint Saturday Stockholm 2014. You can reach them all from http://www.kalmstrom.com/Tips/SPSatIntroduction.htm. In these articles you can find links to the PowerShell scripts mentioned above and to kalmstrom.com Blog posts where the same subjects are discussed more freely. I hope you will find the information useful!